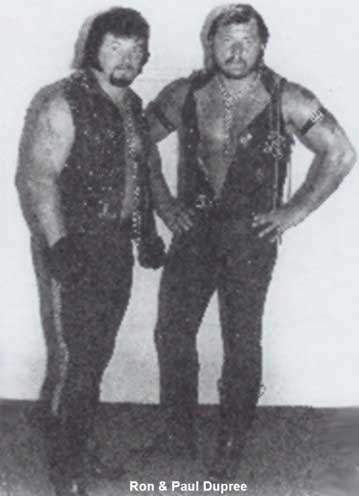 Ronnie & Paul Dupree worked in the Gulf Coast starting in 1967 as “Golden Boy” Ron Dupree & Chuck Dupree..
January 1968: The Hells Angels (Ron & Paul Dupree) defeated Bull & Fred Curry to win the NWA (Ohio) World Tag Team titles..
June 1968: The Hell’s Angels defeated The Continentals (Dapper Dan & Tony Christie) to win the NWA (Ohio) Tag Team titles..
July 4, 1968: The Continentals (Dapper Dan & Tony Christie) defeated The Hells Angels to win back the Ohio Tag Team titles..
Late 1960s: The Hells Angels decided to get some “heat” by burning an American flag on Television..
January 12, 1975: The Hell’s Angels defeated Mike Boyette & Bearcat Brown to win the Gulf Coast Tag Team titles..
Ron Dupree used the fireball and claimed to have “The Power” granted to him by Abdullah Farouk when he was in Detroit..
Ron Dupree died of an in ring heart attack while announcing a bout in Tacoma, Washington..
Ron Dupree had a heart condition and was advised to leave wrestling many times but refused..
Dale Pierce wrote: Ron Dupree was a master tailor who made much of his own ring gear and gear for other wrestlers. His most famous work was a Jonis Joplin robe with images of the late singer. Dupree was also a gourmet cook. Dupree was famous for his gravely voice and loud heel interviews. Some of his statements on Arizona tv included how he was going to fireball Kurt Von Steiger (which he did) and burn him until nothing was left but a pile of ashes they could stuff into a cigar box, and another time where he and Chris Colt again selected Vin Steiger, announcing they were going to reveal the truth about him on tv. The next week, the truth they announced was Von Steiger was “not even a real German” (inside joke) and they had a telegram from Baron Von Raschke saying so (Raschke was German-American and technically not a “real” German either. When Dupree died of a heart attack in mid-ring, wrestlers decided to cancel the show and refund the money to any fans who so desired it. The fans quietly filed out of the arena and not a single one asked for a refund.